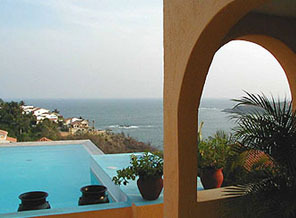 Casa del Mar has 23 spacious junior suites with a private terrace and oceanview, luxury bathroom, safety box, telephone, digital air conditioner and satellite TV. 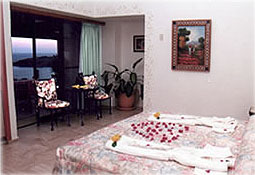 There are 2 master suites with a private jacuzzi on the terrace. The Casa del Mar's spectacular view of the Tangolunda Bay offers the magic and natural beauty of the Pacific Coast of Oaxaca. 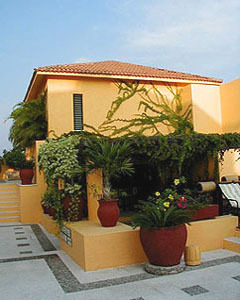 The Casa del Mar is an easy 25 minutes ride from the airport, and only 5 minutes from the golf course. The shimmering surface of the pool blends into the blue waters of the Pacific Ocean and offers an exclusive ambience of romance. In our restaurant you will enjoy the great variety of seafood specialties as well as regional and international cuisine. The sea breezes and the panoramic view of Tangolunda Bay make the perfect compliment for every meal. The prestigious Nisadoo Room, with a capacity of 100 is the perfect choice for meetings, weddings or private parties. Choose the beautiful gardens, the personalized service, and the exclusive ambience of Casa del Mar Huatulco for your perfect Holiday.